Dunkin’ Donuts, the popular fast food chain famous for its coffee and baked goods, has released Dunkin’ Run, a free app for the iPhone and iPod touch. It’s designed to make it easier for Dunkin’ Donuts customers to make group orders — a social application, according to the press release. “I’m making a run to Dunkin’ — does anyone want anything?” is a refrain heard in workplaces near where Dunkin’ Donuts are common. The Dunkin’ Run app and its companion Web site help to make it easier for Dunkin’ customers to solicit and place those group orders. “Runners” initiate the group order, then interactive alerts are sent to the Runner’s friends and co-workers, informing them when a trip is planned and inviting them to place an order online. 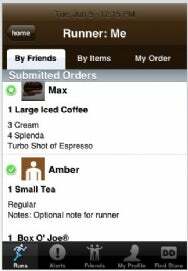 The Runner can then print the order or use their iPhone to produce a checklist, to make sure everyone gets what they wanted.